Hey folks, Valkor here, and a very, merry Christmas to one and all out there on the interwebz. Today is the day I kick back with a hot cup of cocoa, mix it up with cheese and crackers, maybe toss in an apple or two, place them all in a picnic basket and… try and capture one who shall be known as being "smarter than the average bear". 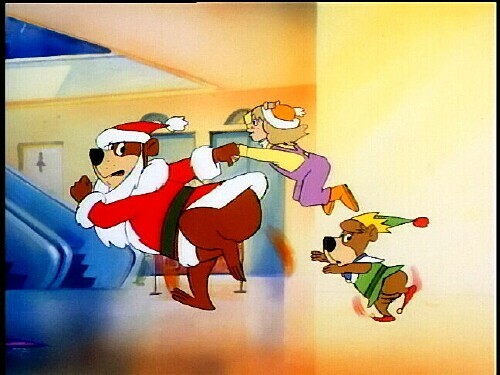 Yogi is back to bring some holiday cheer in a wacky new caper "Yogi' Bear's All-Star Comedy Christmas Caper". 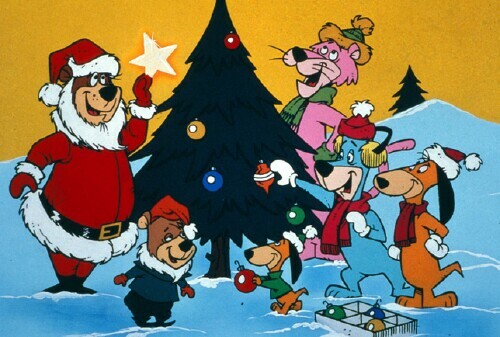 All-Star Comedy Christmas Caper plays out much like the last Yogi DVD I reviewed "Yogi's Great Escape"… sorta. 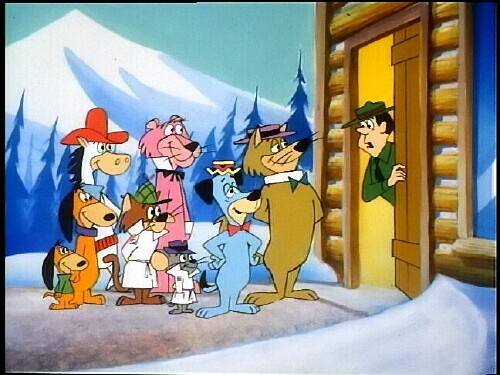 Christmas has come to Jellystone and Ranger Smith wants to take it easy, that is until Yogi's pals – Snagglepuss, Auggie Doggie and his dear old Doggie Daddy, Huckleberry Hound, Quick Draw McGraw, Hokey Wolf, And Snooper and Blabber, show up to spend Christmas with Yogi. However Yogi and Boo-Boo have hitched a ride on a tourist bus to visit them in the city. Things get a little hectic when people find out a bear is on the loose. 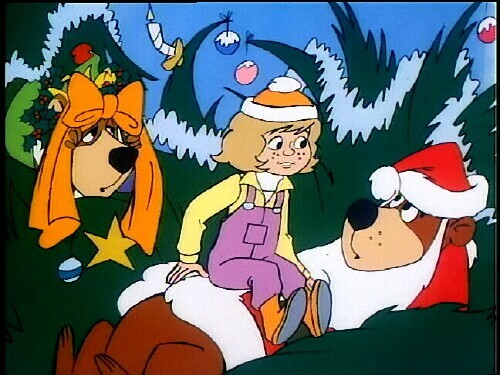 But Yogi snags a Santa disguise (with Boo-Boo as his helper elf), and befriend a little girl named Judy Jones, who only wants to spend time with her daddy for Christmas. Now that she's run off with Yogi, and everyone including the police, are out looking for her. And since she won't tell Yogi and his friends where she lives, they do their best to track down her home, with a little help from other Hanna-Barbera favorites such as Fred Flintstone and Barney Rubble, Wally Gator, and Magilla Gorilla among other classic character favs. In the end Judy is reunited with her dad and rings in the holiday season with her wonderful new friends. 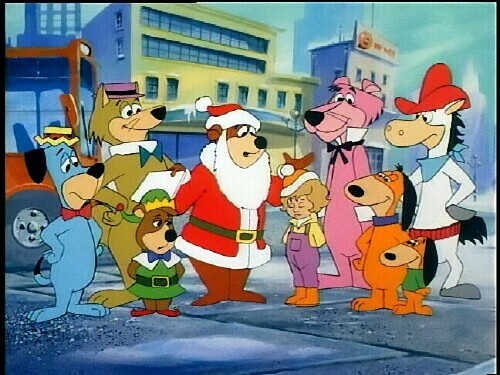 Also included on the disc is Yogi's Birthday Party. The network sponsors want to throw Yogi a birthday surprise on national television. Too bad he knows about it, but that doesn't stop the fun, which includes a catchy song you can sing along to. 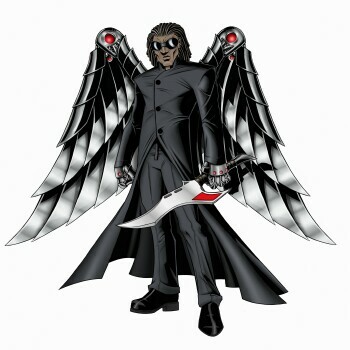 Yea that was a bit syrupy-sweet and thankfully Swat Katz is just around the bend to change all that. But until then what did I think? For a holiday feature, this one will definitely make the holiday rotations but ranks only second to "Yogi's First Christmas". Not that I didn't enjoy this DVD, because I did immensely, including the surprise cameos that appeared. I mean Fred and Barney? What in tarnations is going on here? The story is paced tighter and moves quicker than Yogi's Great Escape, which is a definite plus in my book. Overall expect loads of laugh with some classic characters. What? They couldn't squeeze The Jetsons on a flyby? How does Fred and Barney get to the present, but the Jetsons can't get to the past? Lulz. So our smarter than the average bear took my bait and made a clean break, but not without leaving behind some holiday cheer. 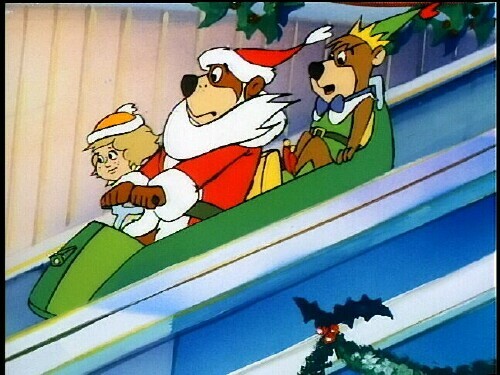 Make no mistake "Yogi Bear's All-Star Comedy Christmas Caper" is a surefire holiday hit any and everyone can enjoy. Out of TOV 5 stars, I give this DVD a 4.5. And it's been Valkor tested, TOV Approved. The Good: Great fun with classic characters! The Bad: What no Jetsons?